Tadaaaam! Christmas is right around the corner, decorations have filled the shops and streets, trees are brightening up living rooms, and you planned your Christmas feast months ago…OR NOT. But don’t worry! Tonton Fabien, winemaker at Château de Garbes, is here to share his expert advice. Just stay with us for the next few minutes and you’ll be able to prepare a Christmas dinner that has something for everyone and, of course, incredible wine pairings. 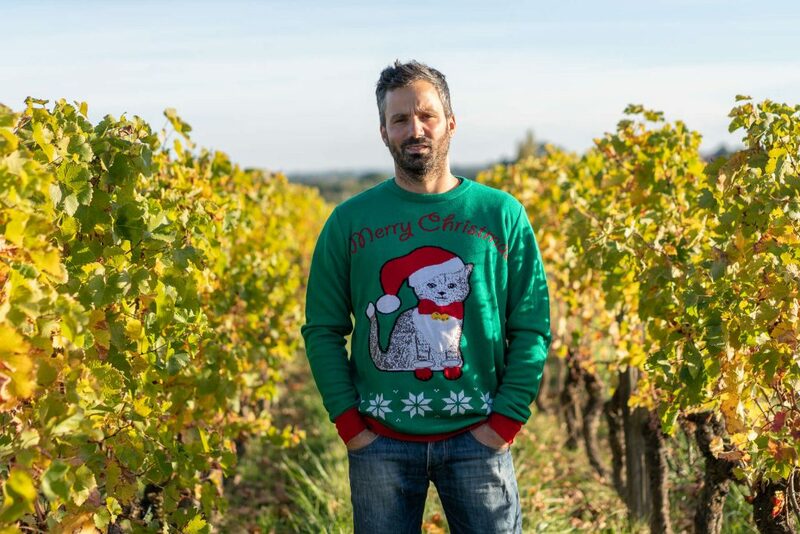 Fabien’s sporting a really special sweater but in this photo I can’t help but notice several different colors of wine, including rosé. I’m intrigued. I mean, rosé at Christmas?? Fabien: Yes, you better believe it! If you like rosé, why wait for summer to drink it? It’s like Sauternes, Cadillac, Barsac…they’re not just something you drink with foie gras–sweet wines can be enjoyed in the summertime, as an aperitif, just like rosé can brighten up the winter holidays! And this rosé, what are we going to cook to accompany it? For Christmas, it’s tough to beat a filet mignon cooked in the oven but, if you don’t want red meat, I’d recommend grilled or sautéed prawns. When the shrimp start to sing in your pan, it’s time to wet your lips with a little rosé. At Christmas we don’t need wines that are as refreshing as what we’d require during the hot summer months, so you can choose a rosé with a darker color, which is usually a sign of more body. You could even serve a Crémant de Bordeaux rosé for an aperitif. Ok, and what about white wines? Oh, we’re already onto the whites? Fantastic. In all honesty, my colleagues in Bordeaux are doing crazy work–the quality is really off the charts these days. It’s always the color that surprises me the most–you have real gold, whether in Graves, Pessac-Léognan, Entre-Deux-Mers, Bordeaux, or Côtes de Bordeaux. To return to your question, though, obviously there’s the classic Bordeaux Christmas treat: oysters…but, to liven things up a bit, I like to add marinated ginger or fish eggs directly on top of the oysters. Heyyyooooo! Stick with me and you’ll be killing it this year. Now, with those oysters you’re probably going to want a rather dry Bordeaux white. But why not mix things up with a slightly fruity red wine that dances on the tongue with that marinated ginger? Trust me: it really works! But what about those who don’t like oysters? There are people who don’t like oysters? Hah, well I know they’re not everyone’s favorite, but we can at least try to change those folks’ minds by combining oysters with a flavor that they do love. For example, for those who think that a life without meat would be unbearable, try roasting the oysters and topping them with diced prosciutto…and serve with a soft white wine. Boom! It may sound like madness, but the idea is to have fun, to create a little! That goes for any food–there’s no obligation to eat the same way again and again every year. Ok, uncle, what are you thinking for the main dish? Well, since we tend to eat A LOT at Christmas, there’s really no need to add a big turkey on top of everything else. Instead, I prefer to center my Christmas dinner around fish. It’s light, it’s delicious, it’s beautiful. Keep it simple and get a nice fresh fish, some fennel, potatoes, butter, olive oil, salt and pepper, and roast it whole in the oven. Perfection. Then, while you’re cooking, open a dry white wine like an AOC Bordeaux, well-balanced and round. Are you salivating? Hey, don’t drool–it’s embarrassing. I love the idea of your fish, but what if we still want meat? In that case, I’d revisit the idea of a white meat that’s both salty and sweet. One combo that works particularly well is poultry cooked in coconut curry paired with a fleshy white like a fine barrel-aged Graves…or a sweet white wine, since they go well with spice. That sounds perfect….but if I prefer red wine, what should I drink? In Bordeaux, of course, there’s so much choice when it comes to reds! Again, there really aren’t any rules that you have to follow. Explore, surprise yourself, and don’t be shy. You don’t have to be an expert to know if you personally like or dislike a certain wine pairing. If you want a little of my advice, though, a robust red like a Médoc is a very good idea with pan-fried foie gras. And for any game birds you can go with a Saint-Émilion or a Pomerol, especially if you’re cooking with mushrooms or truffles. Mmmmm, I love a truffle! What about cheese: we just make a plate? Of course! The more varied it is the better (and the more likely it is to please all palates). Everyone has their favorite cheese, and for me it’s Maroilles. You can’t miss it on the board, and the smell sticks with you for several days, but it is so good with a very dry Graves, or a Médoc if you prefer red…. PS: do you like cheese? Take a look here. Finally, for dessert, what’s your advice? For people with a sweet tooth, this is it: you waited all meal, and now it’s finally time for the real stuff. For me, the Christmas meal–like any good dinner–should end on a note of chocolate. If you’re going with the classic Yule log, you can pair it with an intense red, all round tannins and aromas of red fruits…it’s like two desserts in one! Alternatively, a Crémant de Bordeaux would be perfect too: finishing a feast on a sparkling touch is always a good omen. 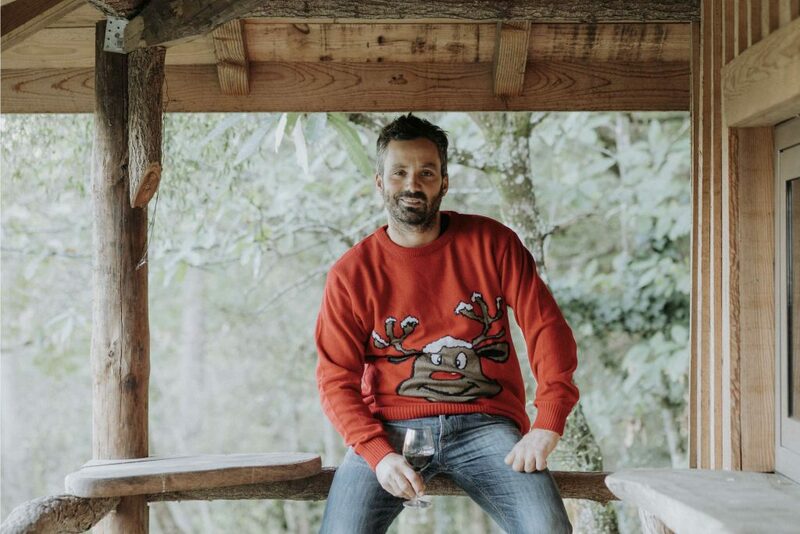 Thanks so much to Fabien David of Château de Garbes for playing the game, and for rocking that ugly sweater so well. Léa Rodrigues-Lalande: young, female, winemaker.